The right-hand side depends on some way on the mass of the entire system -- which is very difficult to observe in any direct way. The left-hand side, on the other hand, can be estimated if we can measure the motions of bodies in the system. Thanks to the Doppler shift, we can determine the motion in the radial direction very easily. Astronomers therefore rely heavily on the virial theorem to turn an easily observed quantity, velocity, into an obscure one: mass. Applying the virial theorem to clusters of stars or galaxies will certainly not yield EXACT masses ... but it's sometimes the only game in town. and some look like train wrecks. If we zoom in on Coma, we see, well, a rather unimpressive set of faint stars. There's another clump just south of Coma, in the constellation Virgo. 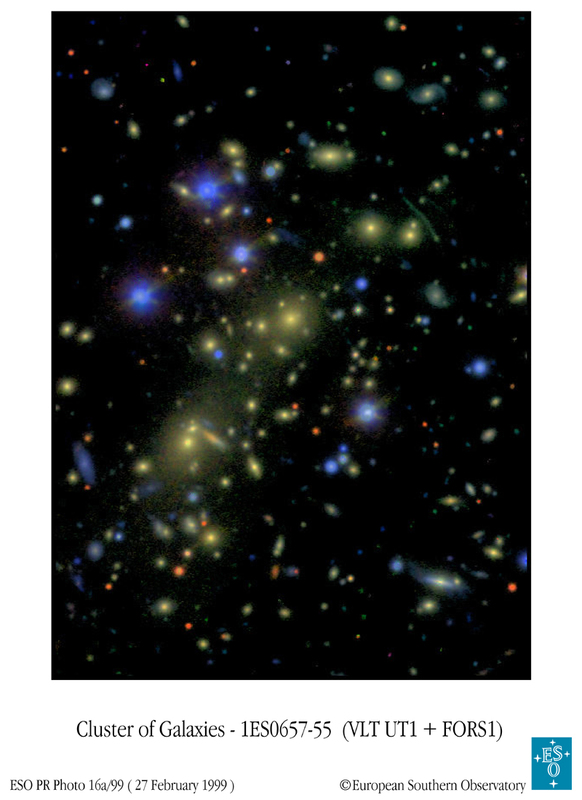 A deep image of this region of the sky shows these galaxies clearly, whether taken in the optical or the X-ray part of the spectrum. Fritz Zwicky was the first to notice a peculiar property of the radial velocities of galaxies in the Coma cluster. He measured the radial velocities for a set of galaxies in the region of the cluster, and computed the radial velocity dispersion. Why don't you do the same? taken from "A catalogue of velocities in the central regions of the Coma cluster", by Biviano et al., Astron. Astrophys. Suppl. Ser. 111, 265 (1995). what is the systemic radial velocity of the Coma Cluster? what is the radial velocity dispersion of the Coma Cluster? assuming that the velocity distribution is isotropic, what is the average value of (3-D space velocity squared) for galaxies in the cluster? But for the right-hand side, we need something like the typical radial distance from the center of the cluster. Look again in the this table of radial velocities. The third and fourth column give the angular distance of each galaxy from the center of the cluster, west and north, respectively, in units of arcseconds. The distance to the Coma Cluster is roughly 100 Mpc. 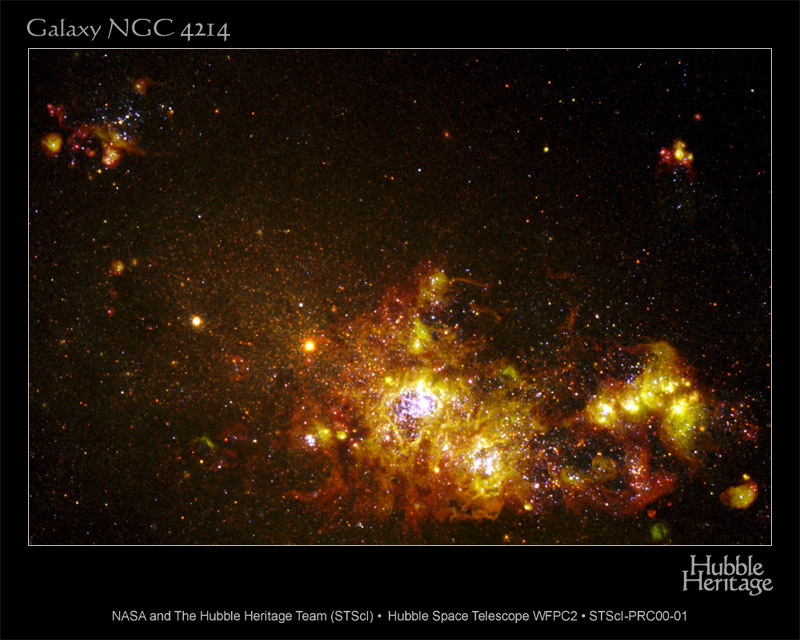 what is the typical distance of these galaxies from the center of the cluster, in parsecs? In AU? use the virial theorem to estimate the mass of the Coma Cluster. Express your result in solar masses. Zwicky's estimate of the distance to the cluster was significantly smaller than our current value, so his calculation of the mass of the cluster was also significantly smaller. 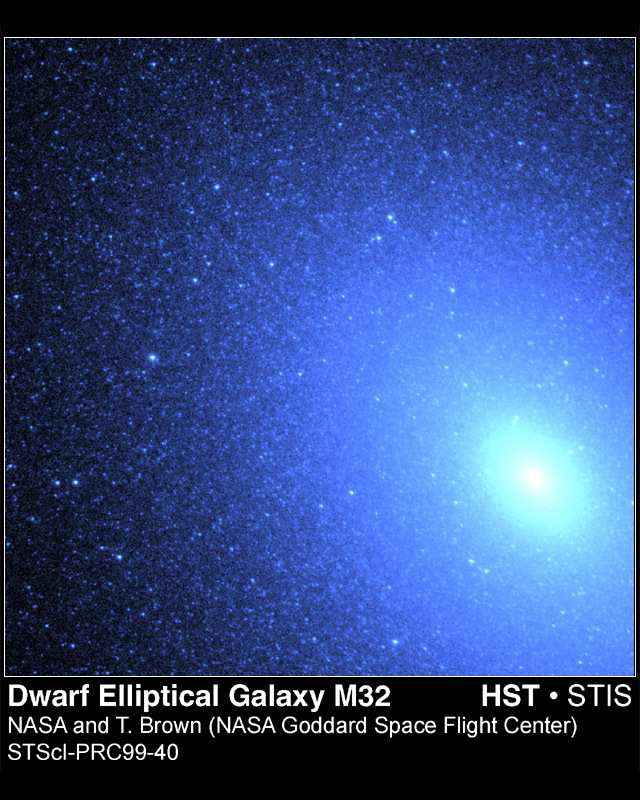 But he noticed a troubling discrepancy in the ratio between the mass of this cluster and the amount of light emitted by its galaxies, and, since that ratio is independent of distance, the puzzle remains to this day. The need for "dark matter"
Zwicky had an estimate of the mass of the entire Coma Cluster. He counted roughly 1000 galaxies in the cluster, so he could compute an average mass per galaxy. What is the average mass you would derive? What ratio of mass-to-light (in solar units) do you find? which, as Zwicky noted, was much, much, much larger than the ratio of mass to light for stars in the local solar neighborhood. Zwicky's 1937 paper does not pick out any one of these possible explanations in particular, though it describes in detail items 2 and 3. In recent years, explanation number 4 -- the existence of some "dark matter" in clusters of galaxies -- has become the most popular. 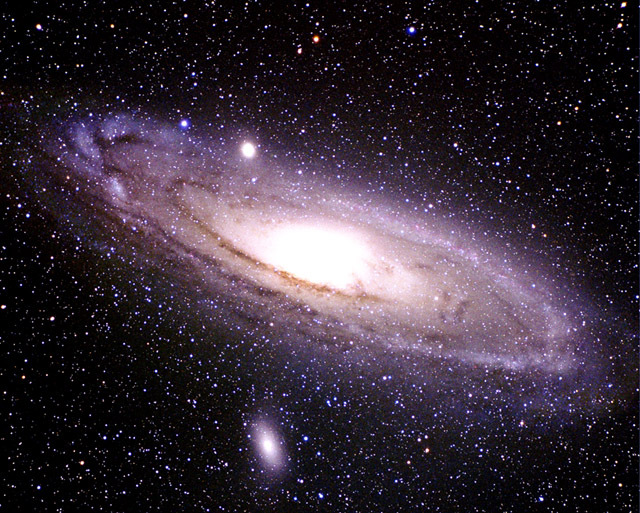 The discrepancy between mass-derived-from-gravity and mass-derived-from-light appears again and again in many large systems: individual galaxies, like the Milky Way, clusters of galaxies, even clusters of clusters of galaxies. Observations of large portions of the universe suggest that the "dark matter" outmasses the "normal matter" by a factor of ten to one hundred. In other words, the ordinary matter we see here on Earth -- atoms and molecules and trees and people -- accounts for perhaps one percent of all the matter in the universe! But what is this "dark matter?" It appears to interact with ordinary matter only by the gravitational force, and not by the stronger electromagnetic force (or the strong or weak nuclear forces). That means that if I tried to hold a chunk of it in my hand, it would fall through my hand and down towards the center of the Earth! Scientists have spent several decades trying to build experiments which might detect this non-baryonic material. Alas, no luck so far.